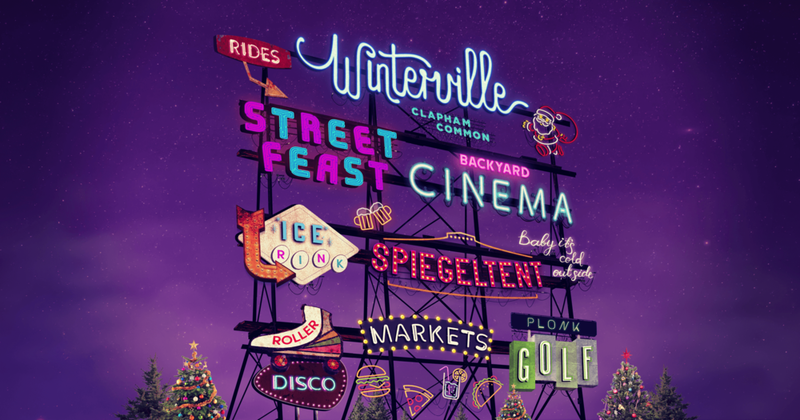 Returning for 2017, the huge Winterville festival features an indoor market filled with creations from independent designers, plus an ice rink, an immersive cinema, Plonk golf, a fairground, a roller disco, a spiegletent hosting cabaret and shows, and various themed bars and street food stalls. Anna Dominoes Millinery will have a stall in the indoor market for the whole weekend along with at least 20 unique fashion and accessory brands (designer/makers and vintage) selected by Wasted Chic Fashion Sales. Market opening times: Fri 4-8pm, Sat 12-8pm, Sun 12-8pm. Entry is free on Friday, and free with a ticket to another attraction on Saturday and Sunday. I will be back at Le Boutique Bazaar on Sunday 8th October with a huge range of hats and headdresses including lots suitable for the Halloween and Christmas party season. The October event is part of London Fetish Weekend and will be a fantastic opportunity to dress up, mingle and meet with like-minded people in a fun environment. McQueen bar is a glamourous central London location (2 minutes from Old Street station), and there will be 40+ designers and makers of unique gothic, burlesque and fetishwear - accessories, latex, millinery, jewellery, headdresses, leather - plus a cocktail bar and DJs. Open until 7pm, click going on the Facebook event page for a discount on entry. Bridport Hat Festival takes place in Dorset at the beginning of every September, with part of the festivities being the Milliners and Hatters Open Competition. I was very happy that the above piece, 'Twist and Turn', was awarded a Highly Commended this year. 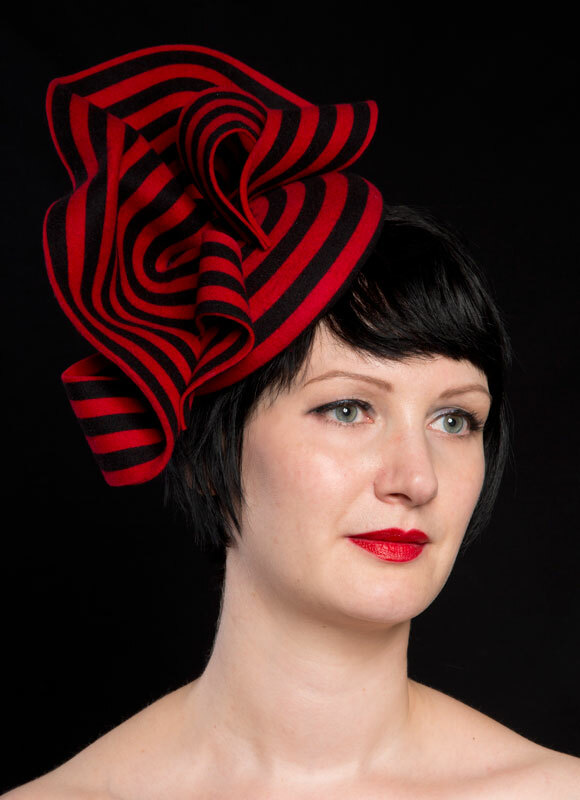 The piece was made from a single striped wool hat felt, using a hand-carved hat block and trim of swirls, paying careful attention to the line-up and arrangement of stripes. Le Boutique Bazaar's summer event - held jointly with Satanic Flea Market - returns on 19th August 2017, at the famous Old Spitalfields Market near Brick Lane, London. I will have lots of new stock including some men's military hats and more floral pieces. 10% at least off all my web prices. There will be 40+ stalls selling jewellery, clothing, latex and accessories, as well as gothic and esoteric homewears, collectibles, zines, taxidermy and more. And what's more this event is FREE! Click 'Going' on the Facebook event page for updates on traders and products. 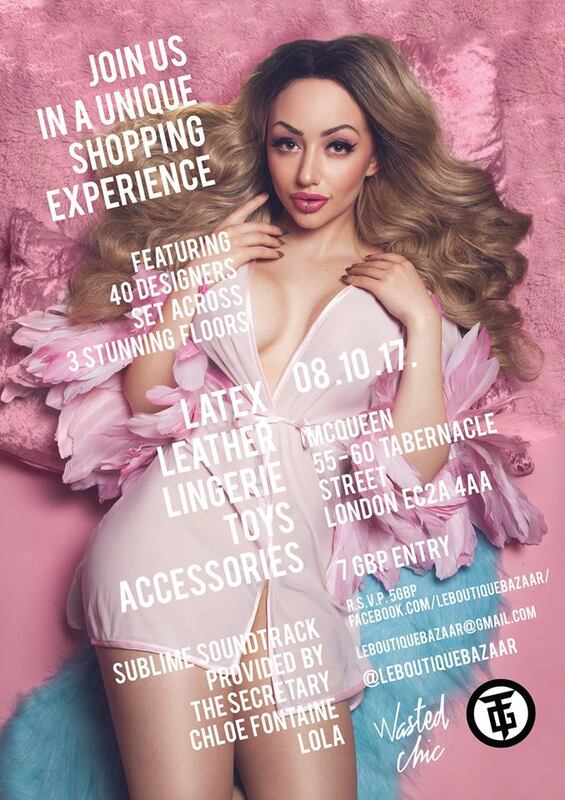 Le Boutique Bazaar's next event is during Whiplr London Fetish Weekend - Sunday 2nd October 2016 at McQueen bar, 55 Tabernacle Street, EC2A 4AA. I'm really excited to be there with new stock including Halloween pieces - there will be 40+ designer/makers selling jewellery, clothing, latex and accessories. It's always an awesome event with music and drinks and loads to see and try on. 10% at least off all my web prices.